Engram caught five of eight targets for 81 yards and a touchdown during Sunday's 36-35 loss to the Cowboys. Engram caught all six of his targets for 87 yards and added 26 yards on two carries during Sunday's 28-27 loss to the Colts. 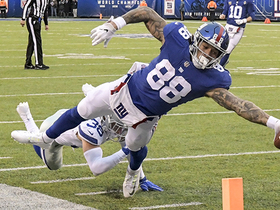 Analysis: Engram helped give the Giants a third-quarter lead when he laid out for a 32-yard grab, setting up an Eli Manning touchdown run. The second-year tight end has now topped 65 yards in four consecutive games after just one such performance in his first six games of the season. Look for that kind of production to continue, especially if Odell Beckham Jr. (quadriceps) misses the finale against a Cowboys team that surrendered seven catches to Engram in Week 2. Engram corralled eight of 12 targets, putting up 75 receiving yards during Sunday's 17-0 loss to Tennessee. Engram (hamstring) caught three of five targets for a team-high 77 receiving yards in Sunday's 40-16 win over Washington. Analysis: Just over half of Engram's yardage came on a 39-yard catch. The Giants raced out to a 40-0 lead against a Mark Sanchez-led Redskins team, so New York's passing game wasn't overly stressed without Odell Beckham Jr. (quadriceps). Engram has dealt with injury issues of his own, but his health seems to be trending up ahead of a Week 15 meeting with the Titans. Engram is slated to return from a two-game absence due to a hamstring injury Sunday against the Redskins but is expected to see his role limited primarily to passing downs, Jordan Raanan of ESPN.com reports. Engram (hamstring) practiced fully Thursday, Dan Duggan of The Athletic reports. Analysis: Prior to Wednesday's limited showing, Engram was held off the field for two contests and every practice since injuring his hamstring during pregame warmups Nov. 25 at Philadelphia. Now with an uninhibited practice under his belt, he's slated to retake his role as the Giants' starting tight end. In his previous matchup with Sunday's opponent (the Redskins) in Week 8, Engram turned nine targets into five receptions for 25 yards and one touchdown. Engram (hamstring) practiced in a limited capacity Wednesday, Art Stapleton of The Bergen Record reports. Analysis: Engram hadn't taken the practice field since injuring his hamstring during pregame warmups Nov. 25 in Philadelphia, missing the Giants' overtime win against the Bears in Week 13 as a result. With a return to drills, the second-year tight end is trending in a positive direction, but it remains to be seen if it'll be enough to play Sunday in Washington. His listing on upcoming injury reports will be worth monitoring as the weekend approaches. Engram (hamstring) has been ruled out for Sunday's game against the Bears, Jordan Raanan of ESPN.com reports. Engram (hamstring) was spotted working out on the side at the start of Friday's practice, Art Stapleton of The Bergen Record reports. Coach Pat Shurmur said Engram (hamstring) will not participate in Thursday's practice, Dan Duggan of The Athletic reports. Analysis: This is not a good sign for Engram's status heading into the weekend, as there has also been nothing to suggest that the tight end will even be able to put in a limited effort Friday. When Engram was sidelined in Sunday's loss to the Eagles, Rhett Ellison operated as the team's No. 1 tight end, hauling in four passes for 77 yards. Engram (hamstring) didn't practice Wednesday, Ryan Dunleavy of NJ.com reports. Analysis: Aside from riding a stationary bike off to the side, Engram was a non-participant in the first session of Week 13. The lack of activity followed no offensive snaps in Sunday's 25-22 loss to Philadelphia, which came after Engram injured his hamstring in pregame warmups. Engram will have two more opportunities to prove his health during practices in advance of this weekend's tilt with the Bears. Engram (hamstring) rode a stationary bike during Wednesday's practice, Jordan Raanan of ESPN.com reports. Analysis: There was some optimism about the tight end's practice availability when he was spotted at the morning walk-through, but it now sounds like he'll be listed as a non-participant on the first injury report of the week. Withheld from Sunday's 25-22 loss to the Eagles after hurting his hamstring during pregame warmups, Engram was optimistic Monday about his chances of avoiding another absence Week 13 against the Bears. He'll have two more chances to practice before the weekend arrives. Engram (hamstring) said he's optimistic about his recovery timetable based on how he performed during a workout Monday under the supervision of the Giants' training staff. Analysis: Engram confirmed that his injury first cropped up during pregame warmups Sunday, rendering him unable to play in a 25-22 loss to the Eagles even though he wasn't included on the inactive list. Rhett Ellison filled in with four catches for 77 yards on six targets, playing 55 of 62 offensive snaps (89 percent). Engram seemingly believes he has a shot to return for the Week 13 game against the Bears, with Wednesday representing his first chance to practice. Engram didn't play in Sunday's 25-22 loss at Philadelphia due to a hamstring injury, Art Stapleton of The Bergen Record reports. Analysis: Per Stapleton, Engram hurt the hamstring in pregame warmups. In Engram's place, Rhett Ellison held down the fort at tight end, hauling in four of six passes for 77 yards. Engram's status will be worth monitoring in advance of next Sunday's game against the Bears. 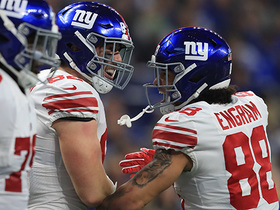 Engram brought in both of his targets for 66 yards in the Giants' 38-35 win over the Buccaneers on Sunday. Analysis: Engram's day would have been classified as a disappointment had he not ripped off a 54-yard catch-and-run in the fourth quarter. The athletic tight end's target share was unexpectedly low, but considering the Giants only put the ball up 18 times, this wasn't exactly surprising. Engram is still looking for his first 100-yard game of the season, and he'll look to accomplish it in a Week 12 divisional battle against the Eagles. Engram caught four of five targets for 46 yards against the Niners on Monday night, three of them on the game-winning drive. 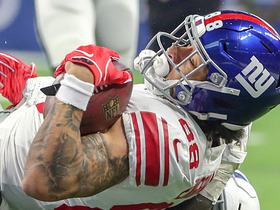 Analysis: Engram was virtually ignored for most of the game, but Eli Manning went to him with the game on the line. He's at best third fiddle behind Saquon Barkley and Odell Beckham, though Sterling Shepard also will command some looks. Engram caught five of nine targets for 25 yards and a touchdown during Sunday's 20-13 win over the Redskins. Engram corralled two of four targets for 16 yards and gained 10 yards on his lone carry Monday in the Giants' 23-20 loss to the Falcons. Engram (knee) logged another full practice Friday. Analysis: Engram has now made it through back-to-back full practices without incident, setting him up for a return Monday night in Atlanta. He'll take aim at a soft Falcons defense that surrendered touchdowns to both of the Buccaneers' top tight ends (O.J. Howard and Cameron Brate) in Week 6. Engram (knee) practiced fully Thursday, Jordan Raanan of ESPN.com reports. Analysis: Engram has been optimistic all week regarding his potential to return Monday in Atlanta, per Ralph Vacchiano of SportsNet New York. After opening preparations for this contest with an uncapped session, Engram appears to be past the MCL sprain in his right knee just in time to face the Falcons' 31st-ranked scoring defense (32.0 points per game). Engram (knee) is taking part in Thursday's practice, Art Stapleton of The Bergen Record reports. Engram (knee) said after Tuesday's practice that he "felt good" and hopes to return Monday in Atlanta, Ralph Vacchiano of SportsNet New York reports. Analysis: Sidelined since Week 3 due to a sprained MCL in his right knee, Engram made attempts to ramp up his workload last week but ultimately didn't have enough time to prove his health for a Thursday night matchup with the Eagles. With an appearance on Monday Night Football upcoming, the Giants aren't required to release an injury report until Thursday. At that point, coach Pat Shurmur will have a better gauge on Engram's odds to return. Engram (knee) was seen participating in Tuesday's practice, Ralph Vacchiano of SportsNet New York reports. Analysis: It's unclear whether Engram was a full participant or not, but the fact that he is on the practice field this early in the week with the Giants not playing until Monday night is an encouraging sign. The extended week of rest seems to have been just what Engram needed, and while a more official update on Engram's status will come once the team releases its practice report, it would be fairly surprising at this point to not see the tight end back on the field Monday. Engram (knee) has been ruled out for Thursday's game against the Eagles, Art Stapleton of The Bergen Record reports. Engram (knee) was listed as a limited participant at Tuesday's practice. Coach Pat Shurmur said Engram (knee) would go "full speed" at Tuesday's practice and could play Thursday against the Eagles, Paul Schwartz of the New York Post reports. Coach Pat Shurmur said Engram (knee) has a chance to return for Thursday's game against the Eagles. Engram (knee) has been ruled out for Sunday's game against the Panthers. Analysis: Engram progressed to straight-line running this week, but he still hasn't returned to practice and will have a tough time making it back for a Thursday game against the Eagles in Week 6. Rhett Ellison will fill in as the top tight end Sunday versus the Panthers, with slot receiver Sterling Shepard also a prime candidate to benefit in terms of target volume. Engram's recovery timeline was estimated at 2-to-4 weeks after he suffered an MCL sprain Sept. 23. Engram (knee) may be a few weeks away from playing in a game, but he's already progressed to straight-line running, Jordan Raanan of ESPN.com reports. Analysis: Listed as a non-participant at Wednesday's practice, Engram at least did some light side work, which amounts to minor progress in his recovery from an MCL sprain. He still doesn't seem to have much shot at playing in Sunday's game against Carolina and Week 6 will also be tough with the Giants hosting the Eagles in the Thursday night game. Rhett Ellison will fill in as the top tight end for the duration of Engram's absence. Engram (knee) didn't participate in Wednesday's practice. Engram (knee) was wearing a brace and sleeve over his injured leg Monday, Matt Lombardo of NJ.com reports. Analysis: Engram is a long shot to return Week 5 at Carolina, considering his timetable was estimated at 2-to-4 weeks when he was diagnosed with an MCL sprain last Monday. Rhett Ellison filled in with an 87 percent snap share in Sunday's 33-18 loss to the Saints, accounting for just three catches and five targets on 41 pass attempts from Eli Manning. It will also be a challenge for Engram to make it back Week 6, when the Giants host the Eagles on Thursday, Oct. 11. Engram, who is dealing with an MCL sprain of his right knee, could be sidelined for roughly 2-to-4 weeks, Ian Rapoport of NFL Network reports. Engram (knee) is considered week-to-week after being diagnosed with an MCL sprain, Adam Schefter of ESPN reports. Engram will undergo an MRI on his knee Monday, Art Stapleton of The Bergen Record reports. Analysis: Engram limped off the field in the second quarter of Sunday's 27-22 win in Houston and wasn't seen for the remainder of the contest. During post-game media availability, he relayed that he "didn't feel right" and "couldn't go" after picking up the injury, which required a brace on his right knee, per Jordan Raanan of ESPN.com. If Engram misses any time, the Giants will turn to Rhett Ellison at tight end. Engram has been ruled out of Sunday's game at Houston due to a knee injury. Analysis: Engram limped off the field in the second quarter, and after attempting to run on the sidelines, he made a visit to the blue tent. The ensuing evaluation apparently revealed a serious enough knee injury to hold him out for the remainder of the contest. The first chance the Giants will have to touch on Engram's injury likely will be during post-game media availability. Engram (ankle) doesn't have a designation on the final injury report for Sunday's game in Houston. Analysis: After logging limited practices the previous two days, Engram made it back to full participation Friday. He should be fine to handle his usual role in a struggling Big Blue offense. Engram (ankle) was listed as a limited participant in Thursday's practice, but head coach Pat Shumur said he expects the tight end will be "fine" for Sunday's game in Houston, Tom Rock of Newsday reports. Analysis: Engram has kicked off the week with back-to-back limited showings in practice, a surprising development after there was no indication that he came out of the Week 2 loss to the Cowboys with an injury. Shumur's comments offer some peace of mind to fantasy owners regarding Engram's status for the weekend, but the 24-year-old's full participation in Friday's session would remove any lingering doubt about his outlook. Engram was a limited participant at Wednesday's practice due to an ankle injury. Engram caught all seven of his targets for 67 yards and a score against the Cowboys on Sunday night. Analysis: The Giants offense was terrible all game, but a blown coverage in the end zone by the Cowboys in garbage time salvaged Engram's day. There's a lot of talent in the Giants offense, but the usage tree is fairly narrow -- only Odell Beckham, Saquon Barkley, Sterling Shepard and Engram see regular looks, so there should be enough to go around. Engram managed just two catches for 18 yards on five targets in Sunday's 20-15 Week 1 loss to Jacksonville. Engram (concussion), who has been medically cleared to practice, shed his non-contact jersey Wednesday. Analysis: The Giants' top tight end is thus in line to play Sunday against the Jaguars, not that there was ever much doubt about his status. While it's not an optimal Week 1 matchup for Engram, he enters the season as a key cog within a star-studded offense that also features wideouts Odell Beckham Jr. and Sterling Shepard and promising rookie tailback Saquon Barkley. Engram (concussion) sported a red (non-contact) jersey during Monday's practice, Art Stapleton of The Bergen Record reports. Analysis: On the plus side, Engram participated in individual drills Monday, which is a positive indicator, but the non-contact jersey suggests that the tight end remains in the NFL's concussion protocol. 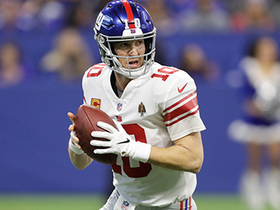 Added clarity regarding his Week 1 status should arrive no later than Wednesday upon the release of the Giants' first regular-season injury report. Engram (concussion) appeared to be participating in individual drills Monday, Art Stapleton of The Bergen Record reports. Analysis: This represents another good sign with regard to the tight end's availability for Sunday's season opener against the Jaguars. Added clarity on that front should arrive no later than Wednesday, when the Giants are required to submit an official practice participation/injury report. Engram (concussion) is expected to be healthy for Week 1 against the Jaguars, Jordan Raanan of ESPN.com reports. Analysis: Engram picked up the concussion in preseason Week 3 and was held out of the Giants' exhibition final Thursday. His progression through the protocol allowed him to get in some work on a side field this past week, but a return to practice in advance of Week 1 would pave the way for an appearance. His first chance to do so will be Wednesday, when the Giants' first injury report of the season will be posted. Engram (concussion) isn't practicing Monday, but he is showing signs of progress in his side work, Art Stapleton of The Bergen Record reports. Analysis: Engram did some light running Sunday and seems to have ramped things up a bit Monday. He still has nearly two weeks to make it through the concussion protocol before a Week 1 home game against the Jaguars. Though Engram (concussion) didn't practice Sunday, he was present for the session, Tom Rock of Newsday reports. Analysis: Per the report, Engram did some light running, which is a positive indicator with regard to his Week 1 status. It's pretty certain that Engram won't play in Thursday's preseason finale against the Patriots, but the tight end should have ample time to gain medical clearance in advance of the team's Sept. 9 season opener against the Jaguars. Engram won't return to Friday's game against the Jets after suffering a concussion. Analysis: Engram was crunched by two Jets players after making a catch and went down holding his head before being escorted to the locker room by training staff. He'll enter the concussion protocol and figures to be out for several days as he works his way back. He ends the day with three receptions for 23 yards. Look for Jerell Adams to see some extra snaps now that Engram is sidelined. Engram wasn't targeted during Thursday's 20-10 loss to the Browns in the preseason opener. Analysis: Engram emerged as New York's top receiving threat after Odell Beckham went down with a season-ending ankle injury last year, but the young tight end failed to make an impact in two drives of work here even with Beckham absent. New York did split Engram out wide on a few occasions, so he appears primed to play a versatile role similar to the one he was used in as a rookie. Engram (ribs) worked out with teammate Davis Webb in February, NJ.com's Ryan Dunleavy reports. Engram (ribs) has been ruled out for Sunday's game against the Redskins, Art Stapleton of The Bergen Record reports. Engram (ribs) did not participate in Friday's practice, Jordan Raanan of ESPN.com reports. Analysis: Engram injured his ribs in last week's loss to the Cardinals, and it appears likely the setback will cut short his rookie season. The Giants will reveal Engram's official status for Week 17 after Friday's session comes to a close. Engram (ribs) was a non-participant at Thursday's practice. Analysis: As he recovers from bruised and sore ribs on his left side, Engram has yet to practice this week. However, he fit in some work on an elliptical bike Thursday, a sign he's attempting to gain clearance from the team's training staff. Friday's practice will mark his last shot to make an impression on the team in advance of Sunday's game against the Redskins. Engram (ribs) wasn't taking part in team drills during the portion of Thursday's practice made available to the media and was instead working out on a bike, Dan Duggan of NJ.com reports. Analysis: Engram was listed as a non-participant in the Giants' first practice of the week when he was also restricted to bike work, so it appears he'll go down as a DNP again when the team releases its Thursday injury report. 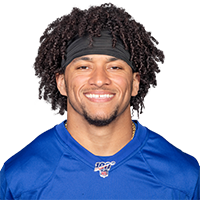 Since Engram is merely dealing with bruising to his ribcage than any sort of fracture, he's hopeful to suit up in the Giants' season finale against the Redskins, but he may need to practice in some capacity Friday in order for that to happen. Engram (ribs), who didn't practice Wednesday, is hopeful that he'll play Sunday against the Redskins, Dan Duggan of NJ.com reports. Analysis: Engram was knocked out of Sunday's defeat in Arizona due to a rib injury. On Wednesday, he confirmed reports that X-rays were returned negative earlier this week and he's merely dealing with bruising and discomfort within the ribs on his left side. In order to achieve his goal of active status this weekend, he'd be best served with an appearance in practice Thursday and/or Friday, at which point the Giants will determine his potential to suit up for the final game of the season. 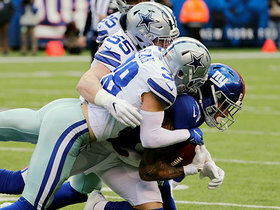 Engram (ribs) stretched with the team but didn't participate in the portion of Wednesday's practice made available to the media, Dan Duggan of NJ.com reports. Engram was diagnosed with bruised ribs on his left side after X-rays earlier this week returned negative, Ian Rapoport of NFL Network reports. Engram has been ruled out of Sunday's contest at Arizona due to a rib injury. Analysis: Initially, Engram was deemed questionable to return with an abdominal issue, but the Giants changed course when declaring him out, instead calling it a rib concern. With his departure, the offense is down to three tight ends in Rhett Ellison, Jerell Adams and Shane Smith. Looking ahead, Engram's status will be one to monitor closely for the regular-season finale against the Redskins. Engram won't return to Sunday's game at Arizona due to a rib injury. Analysis: Eli Manning's first-quarter interception was intended for Engram, who came up gimpy after the play. According to Dan Duggan of NJ.com, Engram was favoring his "left hip" at the time, but the tight end eventually was diagnosed with an abdominal issue. For the rest of the game, the Giants' TE corps has three healthy bodies: Rhett Ellison, Jerell Adams and Shane Smith. Engram was targeted 13 times and came down with eight passes for 87 yards during Sunday's 34-29 loss to the Eagles. He added a 14-yard run during the contest. Engram caught four of seven passes for 54 yards during Sunday's 30-10 loss to the Cowboys. Analysis: Engram led the team in receiving yardage while finishing third in targets, but he struggled to produce much outside of a 35-yard gain in the second quarter. This was still a respectable showing from the rookie, given the struggles of the rest of the offense, but fantasy owners were likely left wanting more at a crucial stage of the season. Engram will face a tough matchup as he attempts to bounce back next week against the Eagles. Engram caught seven of eight pass attempts for 99 yards and a touchdown in Sunday's 24-17 loss to the Raiders. Analysis: Engram's production had been trending down lately, having failed to top 31 yards in any of his past three contests. Perhaps the quarterback change did him some good, as Geno Smith relied on the rookie early and often in this one, and the Mississippi product led the team in catches and receiving yards. At the very least, Engram's fantasy owners should feel reassured as the Giants head home to take on Dallas in Week 14. Engram was targeted seven times in Thursday's 20-10 Thanksgiving loss the Redskins and managed just 18 yards on three receptions. Analysis: After tallying just nine-yards on one reception in Week 11, Engram failed to bounce back Thursday. Most concerning was that he suffered a few drops on catchable balls. The talented rookie may be suffering from a lack of weapons on offense, as opposing defenses are able to focus more on him. He will look to turn things around next week against the Raiders. Engram corralled just one of six targets for nine yards in Sunday's 12-9 overtime win over the Chiefs. Analysis: Engram was the intended target on a pass from running back Shane Vereen that was intercepted at the one-yard line, and he came no closer to extending his touchdown streak to five. The rookie tight end still tied for the team lead in targets despite the down week, so this performance should be viewed as an exception rather than the norm. Engram caught six of nine targets for 31 yards and a touchdown during Sunday's 31-21 loss to the 49ers. Analysis: Engram averaged just 5.2 yards per catch in this one, but he salvaged his day from a fantasy perspective with a nine-yard touchdown pass just before half time. The rookie has surpassed 62 receiving yards just twice this season, but he now has five touchdowns to his name after scoring in four straight games. Engram's fantasy value continues to grow as he serves as the team's top red zone threat, and he'll look to keep it going next week against the Chiefs. Engram caught four of 10 targets for 70 yards and a touchdown during Sunday's 51-17 loss to the Rams. Analysis: Engram led the team in targets and finished tied for the team lead in yardage, finding the end zone from 10 yards out in the fourth quarter. 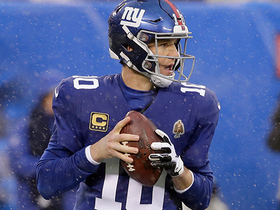 He's quickly become a favorite target of Eli Manning, posting at least 60 receiving yards in four of his last five games and reaching the end zone in each of his last three. Engam should thrive again next week against the 49ers. 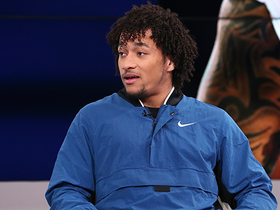 New York Giants tight end Evan Engram joins "Up to the Minute" to talk about his offseason training, 2019 expectations, quarterback Eli Manning and more. 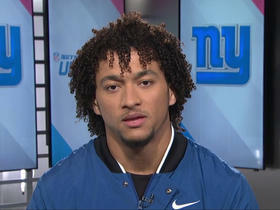 New York Giants tight end Evan Engram sits down with NFL Network's David Carr and LaDainian Tomlinson to talk about the wide receiver Odell Beckham Jr. trade, 2019 expectations, Ole Miss WR D.K. Metcalf and more. New York Giants tight end Evan Engram turns up field for a 51-yard gain down the sideline. 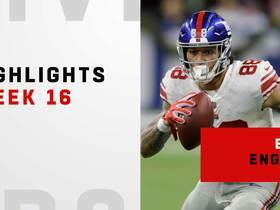 Watch every touch from New York Giants tight end Evan Engram's 113-yard day in Week 16 against the Indianapolis Colts. New York Giants quarterback Eli Manning slings a dart to tight end Evan Engram for a 27-yard pickup. New York Giants tight end Evan Engram reels in quarterback Eli Manning's laser pass for 32 yards. New York Giants tight end Evan Engram sprints on a sneaky TE toss play for a big pickup. 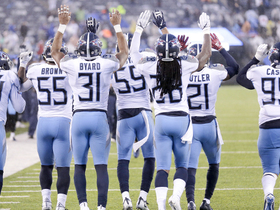 The Tennessee Titans defense celebrates a fourth-down stop against the New York Giants with a dance from the move "Remember the Titans". New York Giants quarterback Eli Manning rolls out the pocket to connect with tight end Evan Engram for a 22-yard gain.